Volumes of 3-D objects can often be determined as a result of considering the volumes of other 3-D objects. 1. What are the common links/factors found in both animations? 2. What is the formula used to link all the sides as you slide the cross section up and down? 3. What is the formula of the Volume of a Cylinder and Cone? 4. 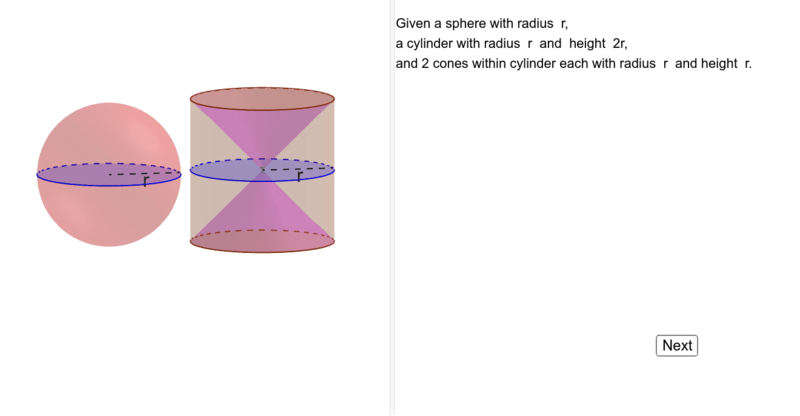 Follow the steps in the activity and using formulas for volume of a cylinder and cone to determine the formula for a sphere.